Home » The 75th Anniversary of D-Day – Make 2019 the year you visit Normandy! The incredible atmosphere at the Normandy beaches that played such an important part in the Second World War is something that everyone should experience. The events that took place in Normandy on 6th June 1944 marked a pivotal point in the war and demonstrated the amazing strength of character, resilience and bravery of all those involved. In 2019 it will be 75 years since the Battle of Normandy so it’s an ideal time to visit and pay your respects whilst learning more about the significance of this historic military operation. The 75th anniversary year will be a time of reflection and celebration of all that was won and lost on these battlefields with parades, military re-enactments, air displays, tours, museum installations, festivities and fireworks. This self-guided walking tour is a 40km trail that takes you through 13 crucial points in the battle for the Carentan Sector. In scenes that seem more like an elaborate film plot than real history, 20,000 American paratroopers were dropped here on June 6th 1944 to fight their German counterparts and protect the troops landing on the beaches. After almost a week of bloody battles the area between Utah and Omaha beaches was secured to allow the two beaches to form a single Allied front. ‘All About Normandy’ offer English speaking guided tours of the main sites of the D-Day battles and the cemeteries that can be tailored to your areas of interest. Experienced, knowledgeable guides will bring history to life in full or half day tour experiences that give a real insight into the dramatic events unfolding here 75 years ago. Nothing can prepare you for the scale of the Second World War cemeteries where the lives of so many soldiers who fought bravely in the battlefields here are commemorated. Fields of crosses and gravestones and memorials carved with so many names of the fallen illustrate in sobering fashion the cost in human lives that was paid for victory. The Dieppe Canadian War Cemetery, the British Military Cemeteries at Ranville and Banneville-La-Campagne, the Sainte-Marie Cemetery at Le Havre and the B-17 Commemorative tablet at Paluel are just a few of the sites you could visit. A jeep tour is a great way to see the full range of D-Day landing sites with ease. There are various options available ranging from an hour-long tour to a half-day experience. 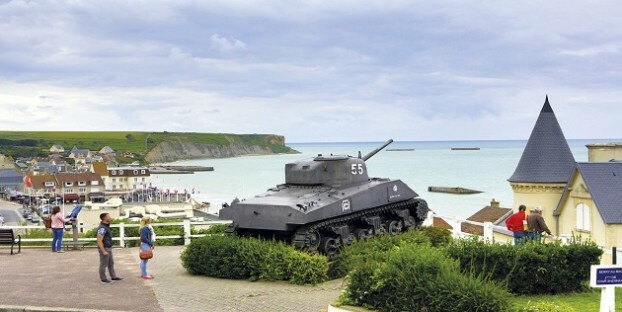 A whistle-stop tour of some of the most iconic Normandy WW2 sites is an ideal way to keep children interested and it’s also a convenient way for people of any age or mobility level to get an insight and a chance to experience the unique atmosphere at these historic locations. There are several exhibitions focusing on different areas of the conflict including the Aéro Mémoire 39/45 at Couterne displaying remains of WW2 planes found in the region in memory of the allied aviators who died here in the course of their duty. The Phillip Morris Cigarette camp at Gonfreville-L’Orcher is a fascinating place to visit where you can see the restored pre-fab wooden buildings constructed here to house 35,000 American troops, and later 4,000 French families left homeless by the conflict. Another exhibition at Saint Marcouf is the museum of the Crisbecq Battery Command Post where you can see inside an Allied bunker and a German command post, both restored to an original state for an atmospheric look back into the lives of the soldiers serving here. Keep up with 75th Anniversary D-Day events as they are announced on the Normandy tourism website and book accommodation in the region with us to get discounted Brittany Ferries crossings and a chance to stay in the heart of this historic part of France.